I'm Jake Parrillo. This is my website. And, in with the new? Yeah. But we're not talking about it. Those four above were from a trip we took last year. 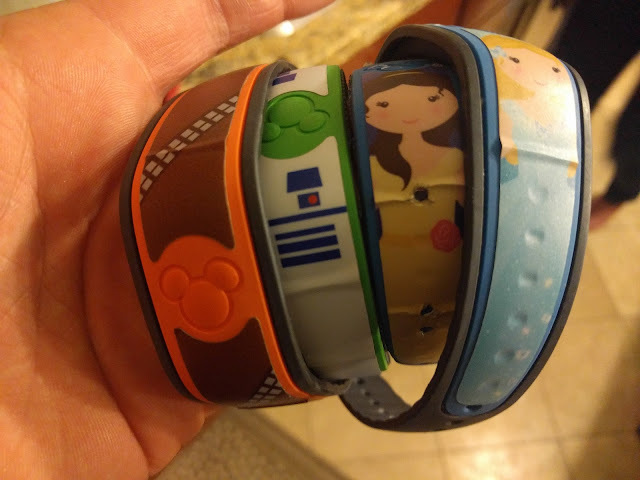 They each have a cover from MyFantasyBands.com which I really like adding to our bands. Mine was Chewie on the left. The Babe had R2D2, The Bird had Belle and Nat rolled with the blue Cindy one. We've bought a bunch of these covers over the years and each time we get new bands, we change them up. There's a bunch of folks who, I think, keep these bands. And while my nature is to hold on to stuff, after I took this photo, these went in the trash. Can't become a horder in my sister's house, amirite?!? Be nice to each other here. Earlier this winter, I wrote about the old Lou Malnati's menu and mentioned that as I was waiting around for my pie to finish up, I spied an old Chicago Tribune article posted on the wall that included the original Lou Malnati's Italian Salad Dressing Recipe. The Tribune reporter called it "prized". We were set to host a little pizza party over the weekend, so I figured I'd give it a shot. Here's the article as seen through my mobile phone's camera. I'm not a wine drinker, so the fact that the recipe called for Burgundy wine didn't strike me as odd. I went shopping at Angelo Caputos in Addison - a really incredible shopping experience - and when I got to the wine section I found Burgundy wine was carried ONLY in those HUGE jugs. And they were dirt cheap. The only issue is that needed just 4 ounces. We ended up with a whole-lotta-wine that Nat won't drink. Move over vegetable garden and garage pavillion, there's potentially a new entrant into the currently crowded backyard at the Parrillo household. Behold: this beauty. The Cedar Summit Panorama Playset from Costco. Comes with 3 swings and a tube slide. Nat spotted this behemoth at Costco and after doing a bit of comparison shopping at a place like Menards (more expensive, I think) and Wannemaker's (don't sell these type of things any more), it appears to be a fair deal. It is a kit - so I'd be putting it together myself, but I'm up for that challenge. The real issue is getting it home. I'm going to head back to Costco to take a look to see if it will fit in Nat's car with the back seats folded down. If not, it seems like I'll be renting a truck from Home Depot. Last week, I posted a photo and description of the Suncast Wood and Resin Playset from our local Costco in Oak Brook Illinois and commented that I was pleased that we purchased the Cedar Summit version last year because I preferred the looks of all-wood version over this year's edition that has a lot of plastic panels and elements. I was surprised that Costco eliminated the Cedar Summit folks in favor of Suncast - it seemed odd to me that they'd take out a nice (seemingly) higher-end product and replace it with something that I perceived as being lower-end with increased pricing. I'm Jake Parrillo and I'm using this space here on the web as a journal of sorts. I'm a 40 year old father of three (2 girls, 1 boy, all beautiful savages). We live out in Downers Grove - in the Western Suburbs of Chicago. I work at Edelman, am an Xoogler and a former Village Trustee. (Yes! I was elected to office 3X.) I'm pizza-crazy,a Disney Dad, a gardener, and even into Lionel O-Gauge trains. I (sometimes) post links and videos over at at www.parrillo.info. can i listen to christmas music? should i get the wings?